Laminate flooring looks like wood, but it isn't, and stains rarely seep through the finish and discolor the flooring material. Even water spots and water rings are usually surface stains, not defects in the finish. Because stains remain on the surface, you can remove them with appropriate solvents or, in some cases, light scraping. Laminate flooring manufacturers recommend strong solvents, such as acetone, for problem stains, but soap, water and vinegar will handle most of stains. Gritty dirt poses more of a danger to your laminate floor than most stains; it can scratch the finish and cause dulling that you can't easily remove. Before you work on removing a stain, you should vacuum, mop or sweep the floor. Use a soft attachment on your vacuum, and avoid one with a beater bar. If you prefer to mop, use a dry mop to avoid letting water stand on the floor, which is potentially lethal for laminates. A microfiber mop works especially well because of its ability to pick up small particles that can lodge in the cracks between planks. Some laminate flooring manufacturers recommend proprietary cleaners to handle such common stains as chocolate, wine, juice and grease. 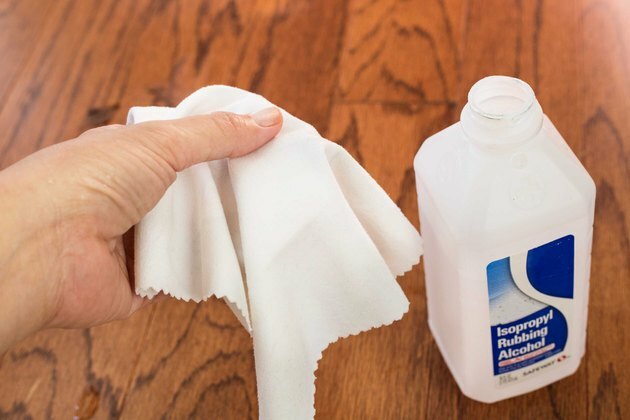 You can make your own cleaner that works as well as these specialty products by mixing equal parts of water and white vinegar and adding a few drops of dish detergent. To remove a stain using this cleaner, spray it on and wipe the problem area vigorously with a soft cloth. It may take more than one attempt to remove a problem stain. If, in the end, the stain won't come out, you need to graduate to a stronger cleaner. 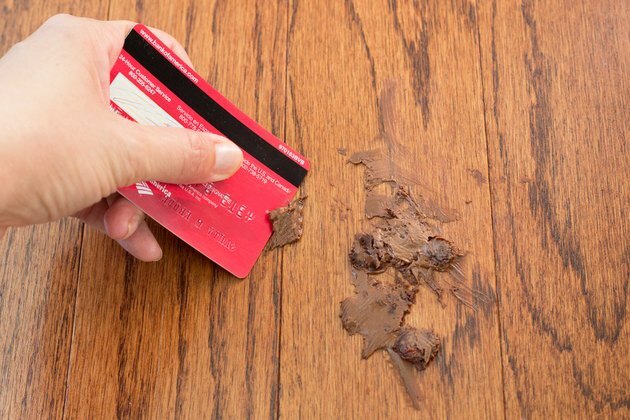 Attempting to rub problem stains out of the floor with an abrasive pad or brush is never a good idea; once you scuff the finish, you can't un-scuff it again, and it will remain dull. 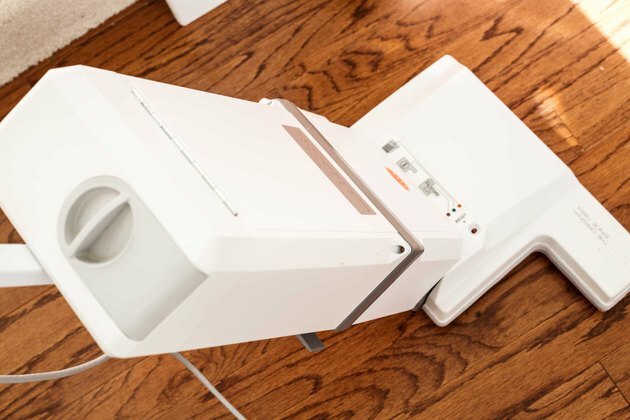 Instead, handle such stains as ink, dye, cigarette marks and wine stains that won't come out with a gentler cleaner by rubbing them with a soft cloth moistened with acetone or rubbing alcohol. Alcohol is most likely to be effective against dyes, while acetone is best for oil-based stains and paints. If one doesn't work, try the other. If you choose to use acetone, it is advised that you wear protective gloves, a proper mask and obtain adequate fresh air. 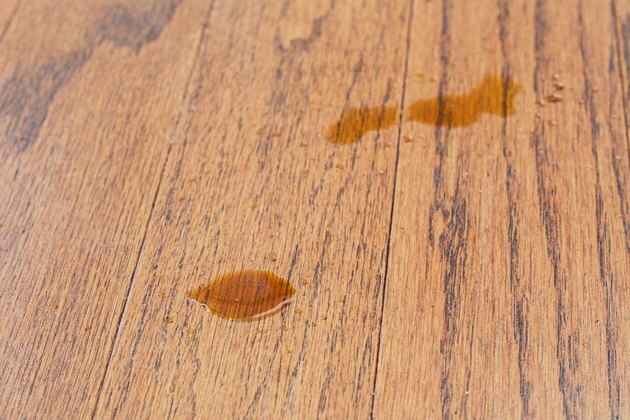 If you get a large paint, tar or grease spill on your floor, and you don't get to it while it's fresh and easy to dab off with an absorbent cloth, the best strategy is usually to let it harden so you can chip it off. In some cases, you can hasten the hardening by placing a plastic bag containing ice cubes on the spill and leaving it there for five minutes. Use a plastic tool, such as a paint scraper, putty knife or even a credit card, to do the scraping to avoid scratching the finish.